The Lesser Sulphur-Crested cockatoo is, as the name suggests, a species that looks like a small version of the Sulphur-Crested Cockatoo. These birds are entirely different species though. The scientific name of the Lesser Sulphur-Crested cockatoo species is Cacatua sulphurea. This bird has white feathers, with a yellow crest and a yellow patch under the wings. Some subspecies of this species have an orange or yellow patch on their cheeks. The bill and feet are black. The Lesser Sulphur-Crested cockatoo occurs in nature on the islands of Indonesia (e.g. Sulawesi, Sumba and others). They live in tropical forests and on the edges of this forest. There are six subspecies of the Lesser Sulphur-Crested cockatoo. These subspecies can interbreed, making it hard sometimes to determine the subspecies or genetic mix of a cockatoo at a zoo or shelter. The most well-know subspecies of the Lesser Sulphur-Crested cockatoo (Cacatua sulphurea sulphurea) is the Citron-Crested cockatoo (Cacatua sulphurea citrinocristata). This subspecies has an orange-colored crest instead of a yellow one. It only occurs on the island Sumba. 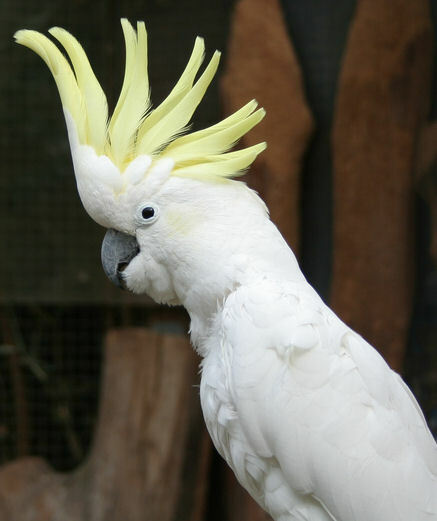 Other subspecies are Cacatua sulphurea djampeana, Cacatua sulphurea abbotti, Cacatua sulphurea occidentalis and Cacatua sulphurea parvula. All these subspecies occur on islands in Indonesia. The Sulphur-Crested cockatoo is a different species than the Lesser Sulphur-Crested cockatoo and even occurs on a different continent. Read more about this big species from Australia here. This is a very popular species of cockatoo to be kept as a pet. They are intelligent, learn tricks easily and can get really affectionate. Just like all cockatoos, they can make very loud noises, need a lot of attention and like to bite in furniture or other things they can find. They can learn to imitate speech, but not as well as some parrots.